BarCamp Prishtina goes international. BCP this November continued its tradition of enthralling meetings, gathering in one place different fellows of diverse backgrounds to share their encouraging ideas. Networking, wide discussions, and interactive presentations characterized this special edition of BarCamp Prishtina. The 33th edition of BarCamp Prishtina brought together more than 100 participants including elders and college students and also people who never attended BarCamp before, all very excited to hear, share different stories and ask questions time to time, thus making this event more fun. 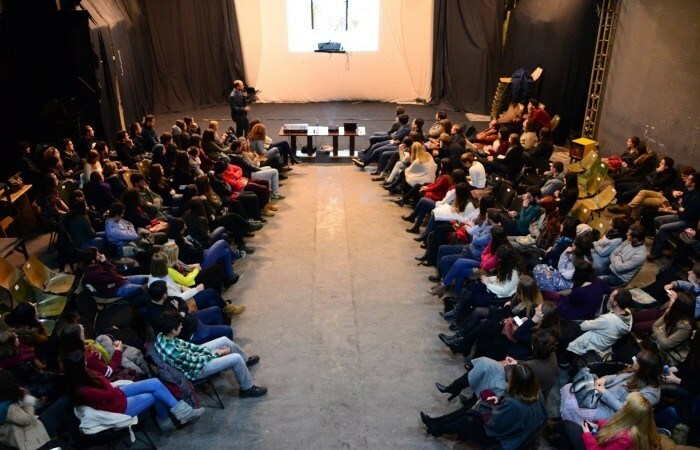 The 33th round of BarCamp Prishtina took place last night at ODA Theatre. The main focus was on International Cultural Exchange, which aimed to let our international citizens (guest speakers) express their thoughts about the differences between our culture and their culture, i.e. to find out how it’s like to be in the shoes of an international citizen living in Prishtina. This time, BCP invited three speakers from three different continents with different backgrounds to share with us their life experiences and to tell us more about the pros and cons of living in Kosovo. The speakers were Seongho Daniel Han, Stefan van Dijk and Daniel Cosentino. Seongho Daniel Han – a young student from South Korea, who has been living in Kosovo since he was 5 years old. Seongho is currently studying medicine at University of Prishtina. Traditional food and karaoke are some of the things that a South Korean student misses when in Kosovo. When he was asked by one of the participants if it was difficult to adapt in Prishtina, he answered “There are always difficulties. Cultural changes, tradition…even humor is different. But, people are adaptable and that’s the good thing! You always think that home is where your parents are. However, being an international person is a privilege. I speak Albanian just like everybody in Kosovo, but I need to improve it in order to write my essays at school”. Nature is one of the things that Seongho likes the most in Kosovo. Daniel is not considering to go back to South Korea, but living in Kosovo seems to be an option for him. Stefan van Dijk – a journalist, blogger, and a communication adviser from Netherlands who emigrated to Kosovo in 2012. He’s the writer of “10 Reasons Why Kosovo Is The Best Country To Live” and that’s what made his speech even more attractive. Van Dijk is also the founder and the manager of the digital platform Kosovo-Info, which is an independent digital platform to inform the world about dozens of topics regarding Kosovo’s Facts, Tourism & Business Information, awesome right? According to Stefan, people in Kosovo are more relaxed. In Netherlands, they talk less and would get crazy for simple things that he enjoys here. “You Kosovars can conquer the world, just like Rita Ora, Dua Lipa, and Lorik Cana are doing. I believe in Kosovo, therefore I want to dedicate my life here”. Daniel Cosentino – an artist from New Jersey, currently the Vise-President of Academic Affairs at AUK/RIT, who shared some stories across national borders. Treat Us Fairly – that’s how Cosentino starts his presentation, with a powerful message for the world out there. Cosentino’s work experience ranges from individual exhibition work to cooperation with artists, designers, choreographers, and architects. During Cosentino’s tenure at Rochester Regional Community Design Center, RRCDC received two awards from the National Endowment for the Arts. Also, some very good work and contribution is being done by Professor Cosentino at Community Design Prishtina. Among many questions, one of the most interesting ones were how long does it take to feel a Kosovar? Well, according to Cosentino it takes a lot… like, emmm hundreds years. Different perspectives of people coming from different continents, living in a small country. That was exactly the idea for this edition. Interesting stories, ideas, experiences and facts were shared and unfolded between speakers and participants like confusing Kosovo with a place in Russia. Oh well, people actually do mix regions of the world. Thanks to all who participated in BCP #33. See you next time with new stories, new peeps!